In the early 60's the Leaksville Daily News periodically ran "mystery pictures" to see how easily readers could identify them. This is an aerial view of my family's place, Sunset Farms on the Price Road, about three miles past the King's Mill Bridge/Eden City Limits. My dad Arthur Holman & grandad "Mr. Round" operated it as a dairy from the mid-twenties well into my youth (some decades later). Dad converted to a poultry operation in the early 60's. 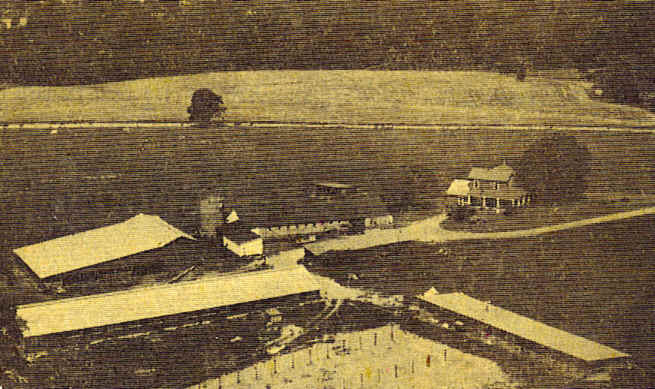 A new 'state-of-the-art' (for that time) poultry facility was the construction under which is underway in this photo. The property was sold a few years after my dad's 1965 death (sadly, just as the poultry effort began to show a little black) and it was made into residential development by 1970. The farmhouse burned about that same time, and most of the structures, obviously, demolished to make way for progress. Oddly enough, the cement block "milking barn" as it was known to me (very center of photo, dark roofing), still survives, and has re-incarnated as an auto repair shop.